If you're still in recovery mode from robocalls, campaign literature, and negative ads, it's not quite over yet. 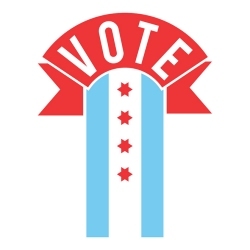 Today marks the official beginning of the city's election season, as all city offices (Mayor, Treasurer, Clerk, and all 50 Aldermen) are up for grabs on Chicago's Election Day, February 26th, 2019. Today is the first day candidates for those offices can file their nominating petitions to get on the ballot. All signatures will be checked for validity and non-duplication by the Election Board, which sets the official ballot. Nominating petitions can be turned in through November 26th, so candidates who did not file today can still be collecting signatures. All candidates in line at 9AM this morning are considered to have filed simultaneously.